Tricia Ross, Historian. Writer. Runner. A popular New Yorker cartoon shows two men in a room full of books. One of them is the stereotypical historian, from the unfashionable glasses to the cardigan sweater. 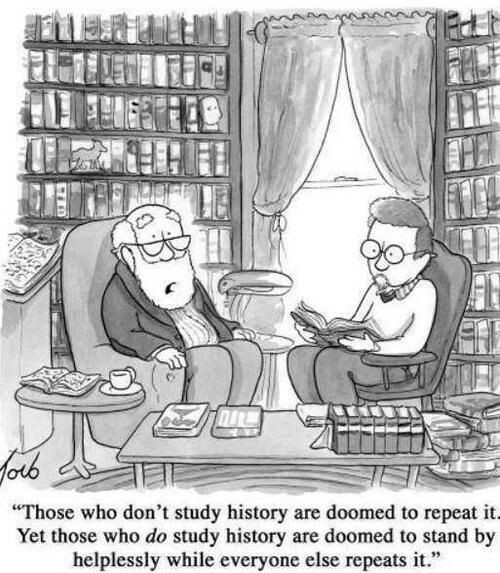 He complains to his therapist like a curmudgeon, in a clever play on George Santyana’s clichéd remark: “Those who don’t study history are doomed to repeat it. Yet those who do study history are doomed to stand by helplessly while everyone else repeats it.” With some justification, this sentiment pervades history departments most of the time. Whatever’s going on, we’ve seen it — and studied it — before. Since the presidential election, this sentiment has grown from a restrained grumble to a primal roar. Graphic analogies abound comparing this new administration and its policies to despots and dictators that historians love to hate. There are heartrending reminders of the USA’s bleak record of the treatment of immigrants, minorities, and the poor, and loud lamentations of the country’s love affair with kneejerk isolationism. Underneath is a sense that historians accustomed to being pooh-poohed are preparing to watch everyone repeat the past. But we are not “doomed to stand by helplessly” — as the cartoon puts it. Modern historians can give us critical perspective on radical and repressive politics in the modern world, on globalization, and on the American state. But we also can and must understand this moment as part of a longer history, of centuries of debate about who we are and what we can be; how religions and political ideas have been related; what justice, reason, and faith mean. As the political landscape shifts, we need the perspective time provides to do more than merely react. Much of the agitated rhetoric at present is fueled by a mix of shock and disbelief that the reality we confront does not neatly conform to cherished stories of progress. How can modern culture and politics prove so fallible, in some cases disastrous? There is incredulity that people in the early-21st century West are prone to the same faults as people in the past, who are customarily dismissed with what C.S. Lewis termed “chronological snobbery.” This attitude has long been a part of our thinking. Already in the 19th century, Nietzsche critiqued the complacency bred during a period of relative comfort and peace that nourished the notion that liberal society had overcome a propensity to believe the lies it confidently condemned when seen in previous generations. Just over a century later, the same self-congratulation undergirds claims that the progressively advanced Better Angels of our Nature and a ballyhooed End of History, buoyed by liberal democracy and capitalism, have us poised to supersede past ills and injustices. In contrast, historians of all people (should) know that the human story is a struggle of truth, love, justice, and light against lies, hatred, injustice, and darkness, in every generation. Those on the extremes — both right and left — easily forget this. History is valuable not so we can congratulate ourselves for relentless progress, or bemoan decline. History displays how beliefs and prejudices have developed and been utilized, and how we understand ourselves — -both now and in the past — by crafting narratives. History reveals people at their best and their worst, perpetrating gory massacres and producing glorious artistic masterpieces. Every act of remembering, stating facts, and acknowledging moments of faith and courage or cowardice and betrayal is a way of engaging in this centuries-long struggle. This is especially important when we hear about “alternative facts” — many of them based on false histories. For a generation that questions facts, recounting them — both those that are inconvenient and those that are inspiring — is an important act. It bolsters resistance against pervasive misrepresentations and fabrications. These concern the United States, and the world, as well as major religions and their adherents. Historians can show that we have debated the demands of justice in every era. No one who reads Thucydides could mistake the consequences of mistreating allies; history makes clear the way demagoguery fed on a crumbling Roman Republic. The fate of any official who questioned Henry VIII’s power plays is eerily familiar. The political consequences of contested interpretations of faith are clear in the long histories of Christianity and Islam; centuries-old debates among believers shape the world today. History is not a story of inevitable progress. It shows successes and failures. Knowing about both is important, to remind us that we must take stands, to remember what we have achieved at times in the past by doing so, and, sadly, what happens when we do not. The choice matters not just now, but for the future.